The OSD IWS25 In-Wall LCR (left, right, center) in-wall center channel provides all the rich, room-filling sound your home theater surround sound system needs at a price that won’t make you feel guilty. Whether you're throwing a party, watching movies with your family, or enjoying music alone, you'll be amazed by the clarity and depth this speaker can produce. 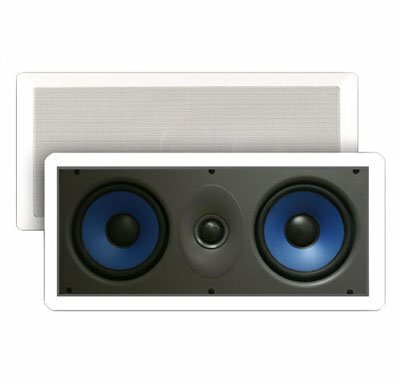 The IW525 can be used as a center-channel speaker in a surround-sound stereo or as a right or left speaker in a high-end system. Its dual polypropylene woofers produce clear, full bass tones with smooth high-frequency roll-off, while the 1" silk dome tweeter gives you distortion-free sound on the high end. The IW525 handles up to 150 watts and has a frequency response between 57Hz and 20kHZ, but it doesn't just sound great--it looks great, too. Flush-mounted and sleek, the speaker is a beautiful, subtle addition to any entertainment room. Plus, it's easy to install. You'll feel like you're in a movie theater or a concert hall. If you want to build your dream home theater system without breaking the bank, the IW525 is the perfect LCR speaker.